FFP Dynamics - Fast, Flawless, Prestige. 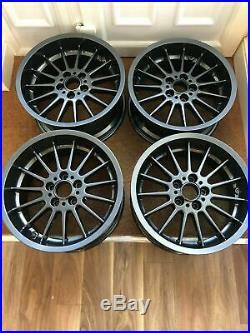 Genuine BMW Alpina Style 32 18 Staggered Alloy Wheels (Professionally Refurbished & Powder Coated) MATT BLACK. 18 PCD = 5 X 120 BORE = 72.6mm. Fronts = 8J ET47 Rears = 8.5J ET50. This listing is for a full set of Genuine (OE) BMW Style 32 Alloy Wheels which have been professionally refurbished to a like new factory finish through our high quality refurbishment process. These wheels are shot blasted back to bare metal before being powder coated and heat baked for a high quality, durable and factory quality finish. Fitted with brand new Genuine OEM BMW centre caps and M badges. We can provide fitting ONSITE. These fit MOST BMW Models including all 1,2,3 and 4 Series Models. E36 E46 F82 F30 F32 E90 E92 etc. If unsure if they will fit - message me. These can also be fitted onto all 5 and 6 series models. WHEELS CAN BE FINISHED IN ANY COLOUR OF YOUR CHOICE - DUE TO THIS PROCESS MAY TAKE UPTO A WEEK FOR DELIVER. - - - - - - - - - - - - - - - - - - - - - - - - - - - - - - - - - - - -. ITEM LOCATION: HUDDERSFIELD (HD5 9AB) - We deliver all over the UK. Send a message for Instant Reply NOW 24/7. The item "Genuine BMW F30 E90 E92 E46 E36 Alpina Style 32 Alloy Wheels 18 BBS Matt Black" is in sale since Wednesday, February 27, 2019. This item is in the category "Vehicle Parts & Accessories\Car Wheels, Tyres & Trims\Rims". The seller is "ffp_dynamics" and is located in Huddersfield.